CD4+ T cell clones derived from a leprosy lesion and patient blood were used to monitor the isolation and identification of an Ag associated with the self-limited form of the disease. Biochemical purification and genetic analysis identified the T cell Ag as a conserved mycobacterial lipoglycoprotein LprG. LprG-mediated activation of CD4+ T cells required specific MHC class II restriction molecules and intracellular processing. Although LprG activated TLR2, this alone was not sufficient to stimulate or inhibit T cell activation. A striking finding was that the carbohydrate moieties of LprG were required for optimal T cell activation, because recombinant LprG produced in Escherichia coli, or recombinant LprG produced in Mycobacterium smegmatis and digested by α-mannosidase, did not activate T cells. This study demonstrates that the universe of bacterial T cell Ags includes lipoglycoproteins, which act as TLR2 ligands but also require glycosylation for MHC class II-restricted T cell activation in vivo. The ability of T cells to recognize protein Ag in the context of MHC molecules is a fundamental paradigm of immunology and is critical to the adaptive immune response. As such, there has been much effort to identify protein Ags from microbial pathogens, neoplasms, or self that contribute to, or protect against, disease in mouse models and humans. It is well documented that CD4+ T cells recognize processed protein fragments (peptides) in the context of MHC class II molecules, whereas CD8+ T cells recognize peptides in the context of MHC class I molecules. In human leprosy, CD4+ T cells are thought to contribute to host defense against the pathogen Mycobacterium leprae. First, the accumulation of memory CD4+ T cells in disease lesions is greatest in tuberculoid leprosy patients in which a high level of cell-mediated immunity against the pathogen exists (1). This is in contrast to lepromatous leprosy patients with the more severe disease and poor cell-mediated immunity. Second, CD4+ T cells derived from such lesions produce the type 1 cytokine IFN-γ, known to be part of the cell-mediated immune response to intracellular pathogens (2, 3). Given that the frequency of M. leprae-reactive CD4+ T cells is 50-fold enriched in leprosy lesions compared with blood from the same individual (4), we have derived CD4+ T cell clones from biopsy specimens and used them to identify native M. leprae Ags. In the present study, we used CD4+ MHC class II-restricted T cell clones from a leprosy lesion and patient blood to identify the Ags recognized by the host response. We discovered that a T cell Ag shared between M. leprae and Mycobacterium tuberculosis belongs to a class of proteins (lipoglycoproteins) thus far described only in Mycobacterium spp., and with structural features responsible for activating the innate as well as adaptive immune responses. Blood and lesion samples were acquired after informed consent using protocols approved by the Institutional Review Board. The leprosy patient (Hispanic male) from whom the biopsy was obtained was diagnosed and classified using the criteria of Ridley and Jopling (5) at the University of Southern California Dermatology Clinics. The patient was undergoing a reversal reaction, clinically upgrading from lepromatous to tuberculoid leprosy at the time of the biopsy. The patient had been undergoing standard antibiotic and steroid (low dose) treatment for 3 years before the biopsy. T cells were isolated from lesions by physical separation of the tissue (6, 7) and cultured in RPMI 1640 medium enriched with sodium pyruvate, penicillin, streptomycin, and l-glutamine (all from Invitrogen) in the presence of human serum (2%) and FCS (8% FCS; HyClone). PBMCs from healthy donors were isolated by density gradient centrifugation using Ficoll-Paque (Amersham Biosciences) and irradiated (3000 rads) for use as APCs. In some cases, APCs were monocyte-derived dendritic cells prepared as previously described (8). HLA typing was performed at the University of California Los Angeles Tissue Typing facility. T cells were cultured with M. leprae sonicate (3 μg/ml) with either autologous or heterologous HLA-DR-matched healthy donor PBMCs followed by a total of three feedings of IL-2 (1 nM, Chiron Diagnostics) 3 days apart. T cell lines from the blood of tuberculoid leprosy patients were derived from PBMCs using the same approach as T cells isolated from lesions (7, 8). T cell clones were derived by limiting dilution as previously described (7). The following Abs were used in blocking experiments: 7.3.19.1 (anti-HLA DRB3*0101, Abcam), 2392 (anti-TLR2; a gift from Genentech), and IgG controls (BD Biosciences). Ag-presenting PBMCs were incubated with Ag and blocking Abs for at least 30 min before the addition of T cells. T cell proliferation and cytokine release assays were conducted as follows: T cells (104) were cultured with heterologous DR-matched irradiated PBMCs (105) with Ag and culture medium (RPMI 1640 with 10% human serum). The assay was conducted in triplicate wells for 72 h, [3H]thymidine (1 μCi/well, MP Biomedicals) was added (4 h), followed by harvest onto scintillation filters and [3H]thymidine incorporation measured on a liquid scintillation counter (Wallac MicroBeta TriLux 1450, PerkinElmer). IFN-γ release was measured by ELISA (BD Biosciences). To demonstrate a requirement for Ag processing, APCs were fixed with glutaraldehyde (0.02%) before or after addition of Ag. We and others have previously used APC fixation to demonstrate that microbial Ags are processed for presentation to human T cells (8, 9, 10). A >2-fold proliferative or cytokine response was considered positive, although in all instances reported in the current study a positive response was >3-fold and frequently >10-fold. Although the T cells are reported in this study are clonal (Ref. 11 and data not shown), they are not hybridomas and, as is typical for human T cell clones, they respond differently from experiment to experiment. The APCs were from different donors and prepared on different dates. Therefore, all experiments were repeated more than once, as indicated in each figure legend. Bacterial lysates of M. leprae and M. tuberculosis, strain H37Rv, were prepared by probe sonication and French press, respectively (12, 13). To isolate the Ag of M. tuberculosis reactive to the leprosy lesion-derived T cell clone (C10E), whole-cell lysate of M. tuberculosis H37Rv (250 mg protein) was suspended in 10 mM Tris (pH 7.5) and applied to an anion exchange resin (Q Sepharose, Amersham Biosciences). The column was washed with 3 column volumes (CV)5 of 10 mM Tris (pH 7.5), and bound proteins were eluted in a step gradient with 3 CV each of 10 mM Tris (pH 7.5) containing 100 mM NaCl, 250 mM NaCl, 500 mM NaCl, and 1 M NaCl. The anion exchange fraction with the greatest T cell activity was further separated by hydrophobic interaction chromatography (HIC). Specifically, the protein fraction (27.1 mg) was exchanged into buffer A (50 mM NaH2PO4 (pH 6.5), 1 M (NH4)2SO4, 0.02% NaN3, 1 mM DTT) and applied to a 3.5 × 1.6-cm column packed with Phenyl Sepharose (Amersham Biosciences). The proteins were eluted with a linear gradient of 100% buffer A to 100% buffer B (50 mM NaH2PO4, 0.02% NaN3, 1 mM DTT) over 3 CV followed by a linear gradient of 100% buffer B to 100% buffer C (10 mM Tris (pH 8.9), 50% ethylene glycol) over 3 CV. T cell-reactive fractions were pooled and exchanged into 10 mM Tris (pH 8.0), 0.2 M NaCl, 0.25% deoxycholate, 1 mM EDTA, and 0.02% sodium azide. This protein solution (4.2 mg) was further separated by high-resolution size exclusion (SE) chromatography using a G75 HR Sephadex column (Amersham Biosciences). This separation yielded two discrete protein fractions with significant T cell reactivity, and identities of the proteins in each fraction were determined by liquid chromatography-electrospray tandem mass spectrometry of trypsin-digested proteins (14). Purifed native LprG/Rv1411c was obtained by standard chromatographic methods from the Tx-114 extract of M. tuberculosis whole-cell lysate as described by Gehring et al. (15). To create a recombinant form of M. tuberculosis LprG (rTbLprG) in E. coli lacking the N-terminal signal sequence, a 650-bp lprG/rv1411c gene fragment was amplified by PCR using the forward primer ATCTCAATCATATGTGCTCGTCGGGCTCGAAG (underlined sequence represents a NdeI site) and reverse primer GTTAAGCTTGCTCACCGGGGGCTTCGT (underlined sequence represents a HindIII site) and M. tuberculosis H37Rv genomic DNA (16) as the template. PCR amplification was performed with PfuUltra Hotstart polymerase (Stratagene) at 95°C for 2 min followed by 10 cycles of 95°C for 30 s, 60°C for 30 s, and 72°C for 1 min; and 25 cycles of 95°C for 30 s, 65°C for 30 s, 72°C for 1 min, and a final 10-min hold at 72°C. The 650-bp PCR product was digested with NdeI and HindIII and ligated into pET23b (Novagen) digested with the same enzymes. This resulted in the recombinant expression plasmid pMRLB43. Recombinant LprG protein was obtained by expressing pMRLB43 in E. coli BL21 (DE3) pLysS (Invitrogen) through the addition of isopropyl β-D-thiogalactoside (0.5 mM final concentration) to a log phase culture grown in Luria-Bertani broth containing 100 μg/ml ampicillin and 34 μg/ml chloramphenicol. After growth at 25°C for 6 h, the cells were harvested by centrifugation at 4400 × g for 10 min at 4°C and suspended in cold breaking buffer (20 mM Tris (pH 7.4), 500 mM NaCl, 5 mM imidazole) containing DNase (0.6 μg/ml), RNase (0.6 μg/ml), lysozyme (100 μg/ml), and EDTA-free protease inhibitor mixture (Roche). A clarified cell lysate was generated by probe sonication (model 4710, Cole-Parmer) and centrifugation at 27,000 × g for 90 min at 4°C. The supernatant was applied to a column (1.5 ml bed vol) of His-Bind Resin (Novagen) and washed with binding buffer (20 mM Tris-HCl (pH 7.9), 500 mM NaCl, and 5 mM imidazole), followed by sequential washings with 20 mM Tris (pH 7.9), 500 mM NaCl, and 60 mM imidazole; 10 mM Tris (pH 7.9); 10 mM Tris (pH 7.9) containing 0.5% ASB-14 (amido sulfobetaine 14); and 10 mM Tris (pH 7.9). The recombinant protein was eluted with 5 ml of 20 mM Tris (pH 7.9), 500 mM NaCl, and 1 M imidzole, and dialyzed against 10 mM ammonium bicarbonate. To generate posttranslationally modified rTBLprG from M. tuberculosis and M. leprae LprG (rLEPLprG) the full-length (720-bp) lprG/rv1411c and (723-bp) ml0577 genes of M. tuberculosis and M. leprae, respectively, were amplified from genomic DNA by PCR using the forward primer TAACTTTCATATGCGGACCCCCAGACGCCACT (underlined sequence represents a NdeI site) and reverse primer GTTAAGCTTGCTCACCGGGGGCTTCGTGA (underlined sequence represents a HindIII site) for rv1411c and the forward primer CATATGCAAGCCCCTAAACATCGCC (underlined sequence represents a NdeI site) and reverse primer AAGCTTGCTCACCTGGGGCTTGGTTA (underlined sequence represents a HindIII site) for ml0577. Amplification was performed as described for the 650-bp lprG/rv1411c gene fragment (see above). The rv1411c 720-bp PCR product was digested with NdeI and HindIII and ligated into the mycobacterial expression vector pVV16, resulting in the recombinant plasmid pMRLB44. The ml0557 714-bp PCR product was ligated into the pCR4Blunt-TOPO cloning vector (Invitrogen), digested with NdeI and HindIII, and the resulting ml0577 gene was ligated into the mycobacterial expression vector pVV16, resulting in the recombinant plasmid pMRLB64. Mycobacterium smegmatis mc2155 transformed with pMRLB44 or pMRLB64 was grown in either Luria-Bertani or 7H9 broth containing kanamycin (25 μg/ml) for 3 days at 37°C with gentle shaking. Cells were harvested by centrifugation at 4400 × g for 10 min at 4°C, and suspended in cold breaking buffer containing urea (6 M), DNase, RNase, lysozyme, and the EDTA-free protease inhibitor mixture. The cells were disrupted by French press and the cell lysate centrifuged at 27,000 × g for 90 min at 4°C. The recombinant proteins were purified as described for the E. coli rTBLprG except that all of the buffers contained urea (6 M). The purified recombinant protein was dialyzed against ammonium bicarbonate (10 mM) via gradual reduction of urea. All protein concentrations were determined by the bicinchoninic acid method, and endotoxin contamination was determined using the QCL-1000 chromogenic LAL endpoint assay (Cambrex). Endotoxin levels in all recombinant LprG constructs were <0.01 ng/mg of protein. Overlapping peptides of M. leprae LprG (20 amino acids with 15 amino acid overlap) were synthesized by ProImmune and used on T cell clones for epitope analysis (17, 18). The rTBLprG produced in M. smegmatis was suspended in binding buffer with 6 M urea and added to a 0.5 ml slurry of His-Bind resin. The slurry was gently rocked at 20°C for 16 h and sequentially washed with 0.05 M sodium acetate (pH 5.5) with decreasing concentrations of urea (4 M, 2 M, 0 M). The protein bound to the His-Bind resin was treated with 50 μg of α-mannosidase (Sigma-Aldrich) at 37°C for 8 h. Another 50 μg of α-mannosidase was added to the slurry, followed by 16 h of incubation at 37°C. The bound protein and resin were poured into a polypropylene column and the protein was eluted with the same series of buffers used to purify the recombinant LprG produced by M. smegmatis. SDS-PAGE was performed on proteins using 4–12% Bis-Tris gels (Invitrogen) and a MOPS buffer (50 mM MOPS, 50 mM Tris-Base, 0.1% SDS, 1 mM EDTA). Gels were either silver or Coomassie stained, or electroblotted to nitrocellulose membranes (Bio-Rad). Nitrocellulose membranes were blocked with 1% BSA in PBS (pH 7.2) for 1 h, washed three times with PBS, and incubated with 1 U of peroxidase-conjugated Con A (Sigma-Aldrich) in PBS for 4 h. Con A reactivity was visualized by developing the blot with 4-cholor-1-naphthol (0.3 mg/ml) and H2O2 (0.3%). Human embryonic kidney 293 cells stably expressing TLR2 and CD14 (kind gift from Genentech) were seeded onto 6-well plates and transiently transfected with a NF-κB luciferase reporter plasmid using SuperFect (Qiagen) as per the manufacturer’s recommendations. Three hours after transfection, cells were split into the appropriate number of wells of a 24-well plate and stimulated with rLprG or the LpqH (19 kDa) lipopeptide (EMC Microcollections) for 18 h. Luciferase activity of whole-cell lysates was measured using the luciferase reporter assay system (Promega) as previously described (19). Monocytes were isolated as previously described (19). Cells were incubated with media, the TLR2 neutralizing Ab (10 μg/ml, kind gift of Genentech), or an isotype control Ab (10 μg/ml; IgG1) for 45 min at 37°C with no serum. Monocytes were then stimulated with media or LprG (0.3 μg/ml) for 24 h in 10% FCS (Omega). Cell-free culture supernatants were collected and levels of IL-12 p40 were measured by ELISA (BD Biosciences). Genomic DNA from T cell clones derived from leprosy patients was isolated using DNAzol reagent (Invitrogen) following the manufacture’s instructions. A fragment containing exon 4 of TLR1 was amplified with the PCR primers forward CTTGATCTTCACAGCAATAAAATAAAGAGCATTCC and reverse GGCCATGATACACTAGAACACACATCACT, as described previously (20). PCR was performed under the following conditions: 3 min of denaturation at 94°C and then 35 cycles at 94°C for 45 s, 56.8°C for 30 s, and 72°C for 2 min. PCR products were visualized by electrophoresis on a 1.4% agarose gel and purified using a PCR purification kit (Qiagen). Purified PCR products were sent to Laragen for DNA sequencing. We previously derived a CD4+ T cell clone from a leprosy lesion, C10E (11). This T cell clone produced a Th type 1 cytokine pattern, directly lysed M. leprae-pulsed APCs by the granule exocytosis pathway, and expressed the antimicrobial protein granulysin. In addition to proliferating in response to M. leprae, the C10E T cell clone was activated by M. tuberculosis (Fig. 1⇓A). Therefore, it was feasible to use cultivatable mycobacteria as a tool for Ag identification. Use of a CD4+ T cell clone derived from a leprosy skin lesion to monitor biochemical isolation of a cross-reactive mycobacterial Ag. A, The leprosy lesion-derived T cell clone (C10E) was stimulated with bacterial lysates in a [3H]thymidine incorporation assay. B, Fractions of M. tuberculosis extract, separated using HIC were pooled and tested for T cell reactivity using the leprosy lesion-derived T cell clone (C10E) in a thymidine incorporation assay. C, Pool 7 from the HIC separation was further separated by SE chromatography and fractions were tested for T cell reactivity using the C10E T cell clone. In each of the panels shown, the data are representative of three or more experiments. Values are expressed as the means ± SEM of triplicate cultures. Anion exchange chromatography yielded a single T cell reactive fraction that eluted with 500 mM NaCl. Further separation of this fraction by HIC revealed a late eluting product (pools 6 and 7) that possessed the greatest T cell stimulatory activity (Fig. 1⇑B). The strong HIC retention of the T cell-reactive material indicated a highly hydrophobic Ag. Pool 7 from the HIC was further purified by SE chromatography in the presence of deoxycholate to reduce hydrophobic interactions. Three SE fractions possessed a potent T cell-stimulating activity (Fig. 1⇑C). One of these SE fractions (fractions 20–22) presented a relatively simple profile of four proteins by SDS-PAGE while the other fractions were much more complex. Analysis of the proteins from SE fractions 20–22 by T cell Western blot (Fig. 2⇓A (7)) demonstrated potent T cell stimulatory activity associated with a 24.5-kDa protein band (Fig. 2⇓B). Digestion of the 24.5-kDa protein band with trypsin and analysis of the resulting peptides by mass spectrometry revealed the presence of two proteins (Rv1411c/LprG and Rv1270c/LprA), both of which are predicted mycobacterial lipoproteins (21). A protein-protein BLAST analysis of the M. tuberculosis LprG and LprA sequences revealed a M. leprae LprG homolog (ML0577) with 71% identity to the M. tuberculosis LprG protein (Fig. 2⇓C). In contrast, LprA possessed 36% identity to the same M. leprae gene product, thus indicating the presence of a M. leprae LprG homolog but not an LprA homolog. In fact, a comparison of the M. tuberculosis lprA genome location to that in the M. leprae genome demonstrated the absence of a large genome fragment of six genes (rv1266c to rv1271c) that includes lprA. Moreover, sequence alignment displays several stretches of nine or more amino acids of identity between the LprG homologs (Fig. 2⇓C). Therefore our further efforts focused on the LprG gene product. Identification of a bacterial lipoglycoprotein (LprG) as a T cell Ag. A, Proteins of SE fractions 20–22 were resolved by SDS-PAGE and stained with Coomassie. Arrows mark protein bands, identified by gel trypsin digestion and mass spectrometry. The asterisk indicates that two gene products were associated with this protein band (Rv1411c and Rv1270c). Question marks denote bands that were unidentifiable. B, Proteins from a separate SDS-polyacrylamide gel were transferred to nitrocellulose, stained with Ponceau S, excised, and evaluated for T cell reactivity using the leprosy lesion-derived T cell clone (C10E). C, Amino acid sequence comparison between LprG of M. leprae and M. tuberculosis. D, T cell response to recombinant M. tuberculosis LprG (rTbLprG) expressed in M. smegmatis. The data are expressed in ng/ml IFN-γ as measured by ELISA. Rv1837c (GlcB) is a recombinant M. tuberculosis protein (unrelated to LprG) expressed in M. smegmatis. E, T cell clones respond to recombinant M. leprae LprG (rLepLprG) and rTbLprG produced in M. smegmatis. F, Proliferative response of LprG-reactive T cell clone to LprG presented by monocytes or monocyte-derived dendritic cells. In B and D–F, the data are representative of three or more experiments. Values are expressed as the means ± SEM of triplicate cultures. G, Proliferative response of M. leprae-reactive T cell clones derived from leprosy patients. Representative data are expressed as “Stimulation index” (cpm Ag/cpm media) from three or more independent experiments. Filled symbols indicate LprG-responsive T cell clones; open symbols, LprG-nonresponsive T cell clones. A recombinant form of LprG (rTbLprG) was produced in M. smegmatis and was found to activate the C10E T cell clone (Fig. 2⇑D). An irrelevant M. tuberculosis recombinant protein, Rv1837c, was also expressed in M. smegmatis and did not activate the T cell clone (Fig. 2⇑D). The response of the T cell to rTbLprG was somewhat weaker relative to sonicated M. leprae, suggesting that native posttranslational modifications are required for optimal MHC class II-restricted T cell activation. In addition to rTbLprG, a recombinant form of the M. leprae homolog (rLepLprG) was also produced in M. smegmatis to demonstrate that the M. leprae LprG protein activated the T cell clone. The T cell clone was activated by both rLepLprG and rTbLprG equivalently over a range of protein concentrations (Fig. 2⇑E). To determine whether additional T cells from mycobacteria-infected individuals responded to LprG, we derived T cell clones from a second leprosy patient. Fig. 2⇑E shows the response of one representative T cell clone of four, demonstrating proliferative responses to both rLepLprG and rTbLprG. These data indicated a conserved mycobacterial T cell epitope shared between M. leprae and M. tuberculosis, and that either recombinant protein could be used to evaluate immune reactivity. Both monocytes and monocyte-derived dendritic cells were effective in presenting rLprG to T cells (Fig. 2⇑F). In contrast to these two LprG-specific T cell clones, six additional M. leprae-reactive clones did not respond to rLprG (Fig. 2⇑G), indicating that rLprG does not activate all T cells in a nonspecific manner. Both LprG-reactive T cell clones were derived from leprosy patients, suggesting that these T cell clones are derived during the course of infection, whether from leprosy or tuberculosis, or as a result of immunization prevent tuberculosis infection. To determine whether activation of LprG-reactive T cell clones was restricted by MHC class II molecules, APCs from both HLA-DR-matched and unmatched donors were obtained (Fig. 3⇓A). C10E responded to LprG only when presented by HLA-DR-matched donors (Fig. 3⇓B). The second T cell clone, 1024B, also responded to LprG only in the presence of HLA-DR-matched donors. Based on these studies, it was possible to conclude that C10E was restricted by HLA DRB*1502 or HLA DRB5*0101, which are expressed in linkage disequilibrium, and that 1024B was restricted by HLA DRB3*0101. To determine the exact MHC restriction element, a mAb to HLA DRB3*0101 was used to block Ag presentation. 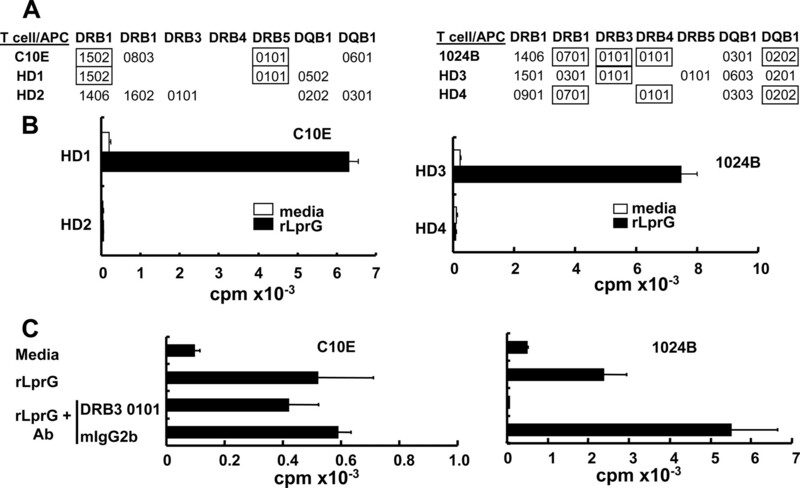 Anti-HLA DRB3*0101 blocked the response of the 1024B T cell clone, but not the C10E T cell clone (Fig. 3⇓C), indicating Ag presentation to 1024B was restricted by HLA DRB3*0101. The absence of known blocking Abs to HLA DRB*1502 and HLA DRB5*0101 prevented us from making a more precise identification of the restriction element for clone C10E. However, given the different HLA DR types of the two patients from which the T cell clones were derived, the two T cell clones are activated by LprG in the context of two distinct HLA DR molecules. LprG is presented by two distinct HLA DR molecules. A, HLA DR genotyping of leprosy T cell clones (C10E and 1024B) and healthy Ag-presenting cell donors (HD1–4) used for T cell assays to determine HLA DR restriction of rLprG (B). B, T cell assay linking HLA DR type with T cell response to LprG. C, LprG-reactive T cell response in the presence of neutralizing Abs to HLA DRB3*0101. In B and C, the data are representative of three or more experiments. Values are expressed as the means ± SEM of triplicate cultures. Ag presentation of LprG to the T cell clones was inhibited by treatment with trypsin, indicating that Ag presentation was dependent on the protein component of the Ag (Fig. 4⇓A). To determine whether intracellular Ag processing was required for T cell activation, APCs were fixed with glutaraldehyde before and after pulsing with Ag. Glutaraldehyde fixation of APCs for presentation of a nonglycosylated, nonacylated microbial protein, rGroES, prevented T cell activation (Fig. 4⇓B), whereas fixation of APCs before addition of a GroES28–39 peptide epitope did not prevent T cell activation (Fig. 4⇓C). APC fixation after addition of rLprG preserved the ability of APCs to activate specific T cells, although the response was lower than no fixation with addition of Ag alone (Fig. 4⇓D). In contrast, addition of LprG after fixation abrogated T cell activation, indicating a requirement for intracellular processing of the Ag. Moreover, the loss of LprG reactivity if glutaraldehyde fixation of APCs preceded Ag pulsing is most consistent with the presentation of cognate Ag vs superantigen (22, 23). Overlapping peptides spanning the entire M. leprae sequence were synthesized, yet none was found to activate the T cell clone, in contrast to the recombinant, full-length protein (Fig. 4⇓E). A lipoglycoprotein (LprG) is presented to T cells like a traditional protein Ag. A, Digestion of rLprG with trypsin destroys T cell recognition. B–D, APCs were fixed with glutaraldehyde before (top two rows) or after (lower two rows) pulsing with Ag (B-Ag indicates rGroES protein with GroES-reactive T cells (47 ); C-Ag, GroES28–39 peptide with GroES-reactive T cells; D-Ag, rLprG with LprG-reactive T cells). E, LprG-reactive T cell response to synthetic, overlapping peptides (20 amino acids with 15 amino acid overlap) spanning the length of LprG protein. Solid line represents the T cell response to full-length rLprG; dashed line represents T cell response to media. The data are representative of three or more experiments. Values are expressed as the means ± SEM of triplicate cultures. The native LprG of M. tuberculosis was previously shown to be a TLR2 ligand (15), and amino acid sequences of M. leprae and M. tuberculosis LprG contain N-terminal cysteine lipidation sequences, suggesting that these proteins are triacylated, as is typical for bacterial lipoproteins that act as TLR2/1 agonists. To determine whether M. leprae LprG could activate TLR2, HEK cells were transfected with hTLR2 and an NF-κB reporter. Addition of LprG triggered NF-κB activity (Fig. 5⇓A). To demonstrate that rLprG activates TLR2 in primary cells, human monocytes were stimulated with rLprG in the presence or absence of neutralizing Abs to TLR2. TLR2 Abs inhibited rLprG-induced production of IL-12p40 from human monocytes (Fig. 5⇓B), demonstrating that the recombinant protein activates monocytes through TLR2. T cell response to LprG, a TLR2/1 ligand, is not mediated through TLR2/1. A, rLprG induces activation of a NF-κB promoter in TLR2/1 transfected HEK cells. LpqH is a synthetic N-terminal triacylated lipopeptide containing the first 15 amino acids of M. tuberculosis 19-kDa lipoprotein (LpqH) distal to the N-terminal cysteine. B, rLprG-induced cytokine production from monocytes is TLR2 dependent. Cytokine production was measured by ELISA. C, rLprG, but not LpqH, induces proliferation of a LprG-reactive T cell clone. D, Neutralizing Ab to TLR2 does not prevent LprG-mediated activation of an LprG-reactive T cell clone. The data are representative of three or more experiments. Values are expressed as the means ± SEM of triplicate cultures. 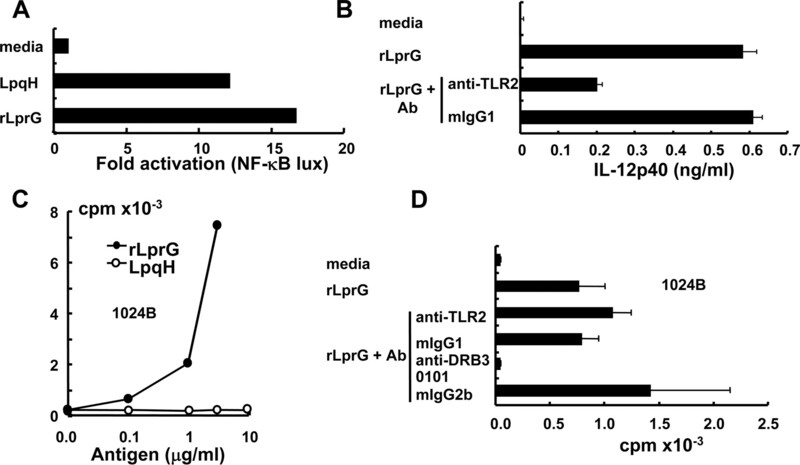 Although LprG is acylated, the T cell response was not due solely to the N-terminal acylated peptide activating TLR2, because an irrelevant lipopeptide derived from the M. tuberculosis LpqH Ag did not induce proliferation of LprG-reactive T cell clones (Fig. 5⇑C). Furthermore, anti-TLR2 mAb did not block LprG-induced T cell proliferation (Fig. 5⇑D), in contrast to the adjuvant effect of bacterial lipoproteins we previously demonstrated on T cell responses (24). Taken together, these data indicate that the acyl function of LprG confers TLR2 stimulatory capacity but does not augment or inhibit the Ag presentation of LprG to T cells. Recently, a common polymorphism in TLR1 (I602S) has been reported that is associated with abrogated TLR signaling and a reduced incidence of leprosy (20). We evaluated the TLR1 genotype of the patients from which the T cell clones were derived. The TLR1 genotype of both patients was wild type (isoleucine at amino acid 602), that is, it did not contain the polymorphism associated with abrogated TLR signaling and reduced incidence of leprosy. Several of the M. tuberculosis lipoproteins are known or predicted to be glycosylated (25). The first clue as to the requirement for glycosylation of LprG for efficient Ag presentation to T cells was gained from the comparison of responses to rLprG expressed in M. smegmatis vs E. coli. The striking finding was that rLprG expressed in M. smegmatis, but not that in E. coli, induced T cell proliferation (Fig. 6⇓A). Given that part of posttranslational modification of proteins in E. coli does not include glycosylation and that glycosylation is characteristic of proteins in mycobacteria, we hypothesized that the carbohydrate moieties present in LprG might be required for Ag presentation. However, the LprG expressed in E. coli did not contain the acylation signal sequence. The LprG expressed in M. smegmatis was analyzed by MALDI-MS but because of the acylation, a broad and poorly defined peak was observed. The presence of glycosylation was confirmed based on reactivity to Con A (Fig. 6⇓B). To determine whether glycosylation of LprG was required for a T cell response, we extensively treated the recombinant LprG produced in M. smegmatis with α-mannosidase (Fig. 6⇓A), an enzyme that cleaves α1–2 and α1–3 mannose residues. Mannosidase treatment of LprG abrogated the T cell response (Fig. 6⇓C), indicating the requirement of glycosylation for either proper Ag processing or presentation to the T cell clones. These data indicate that glycosylation of LprG is required for MHC class II-restricted T cell activation. Glycosylation of LprG is required for MHC class II-restricted T cell activation. 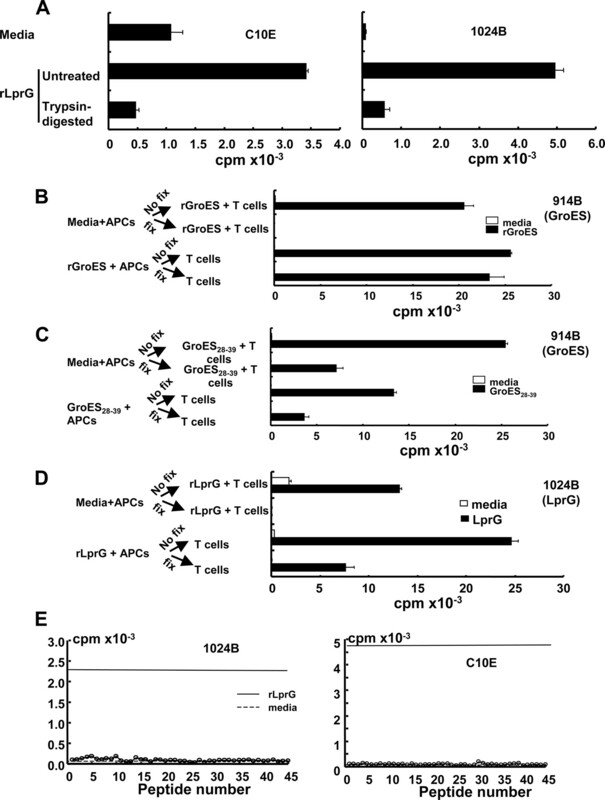 A, rLprG expressed in M. smegmatis, but not E. coli, activates a LprG-reactive T cell clone. B, SDS polyacrylamide separation and Coomassie staining of rLprG expressed in E. coli or M. smegmatis shows a protein of ∼25 kDa (upper panel). Con A Western blot to identify sugars on the recombinant proteins (lower panel). 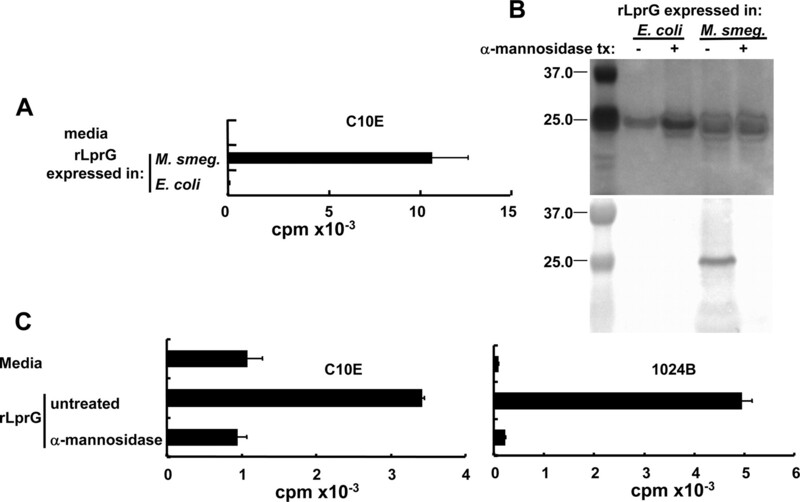 C, α-Mannosidase treatment of recombinant LprG abrogates T cell responsiveness. The data are representative of three or more experiments. Values are expressed as the means ± SEM of triplicate cultures. The ability of CD4+ T cells to distinguish foreign from self largely requires processing of protein Ags and presentation to T cells in the context of MHC class II Ag processing molecules. Using CD4+ T cell clones from leprosy lesions and patients to monitor biochemical purification and genetic expression, we have identified a novel class of T cell Ag, a lipoglycoprotein. LprG behaved liked a classical protein Ag, requiring presentation by specific MHC class II molecules, intracellular processing, and an intact protein component. As a lipoprotein, LprG activated innate immune responses via TLR2, but the N-terminal lipopeptide motif was not sufficient nor did it inhibit T cell responses. Strikingly, glycosylation was required for MHC class II-restricted T cell activation, because the nonglycosylated recombinant protein or α-mannosidase treatment abrogated T cell responses. These data indicate that lipoglycoproteins can activate the innate and adaptive immune response, serving both as TLR2 agonists and as part of the universe of T cell Ags. Bacterial lipoproteins are exported via the Sec-dependent system, and during the translocation process and clipping of the signal peptide the N-terminal cysteine residue of the mature protein is triacylated with a thioether-linked diacylglycerol and an amide-linked fatty acid. These structures are thought to be ubiquitous in all bacteria, except Mycoplasm spp., where the lipoproteins lack the amide-linked fatty acid (26, 27). M. tuberculosis and M. leprae are predicted to encode 79 and 35 lipoproteins, respectively. In contrast to protein acylation, modification of bacterial proteins with carbohydrate moieties is not common, and protein glycosylation has been described for only a small number of bacterial species. Moreover, the forms of protein glycosylation differ significantly among those bacterial species that perform this function. In Mycobacterium spp., modification of proteins with oligomannose units is the only form of glycosylation identified thus far (28). Furthermore, as with acylation, the process of protein glycosylation in mycobacteria has been shown to be linked to Sec-dependent protein export (29). Several putative lipoglycoproteins have been reported in M. tuberculosis and a number of these are known T cell Ags (28), but these simultaneously occurring dual posttranslational modifications are thus far unique to mycobacteria, not having been described in other bacteria. Although protein glycosylation has not been described in M. leprae, this bacterium does possess a homolog of the M. tuberculosis protein mannosyl transferase (Rv1002c) required for initiation of protein glycosylation (29). The current studies demonstrating that activation by LprG of specific T cell clones from leprosy patients is dependent on glycosylation provide strong evidence that the native LprG of M. leprae is also glycosylated. Treatment of rLprG with α-mannosidase dramatically reduced the T cell response, indicating that MHC class II-restricted T cell activation of LprG required the carbohydrate component. Moreover, synthetic overlapping peptides of LprG, containing amino acids without carbohydrate, did not activate either of the LprG-reactive T cell clones, suggesting that the carbohydrate is part of the T cell epitope, that is, a glycopeptide. The data suggest the possibility that there are two distinct T cell epitopes, because LprG activated the T cell clones in the context of different MHC class II molecules. We think that these data provide new evidence that bacterial glycopeptides are T cell Ags. Previously, glycopeptide epitopes as TCR ligands have been demonstrated in human autoimmune disease (30) and artificially glycosylated model Ags (31). Complex carbohydrates are not removed during processing of glycoproteins by dendritic cells (32), so it remains possible that glycopeptides within LprG are recognized by the TCRs of T cells from leprosy patients. An alternative, but not mutually exclusive, explanation for the requirement of the carbohydrate moiety of LprG is a role in Ag uptake or processing. Lectin-binding receptors including the mannose receptor are required for efficient endocytosis of glycoprotein (33) and glycolipid (34, 35) Ags for their presentation to T cells. In the present study, it was not possible to differentiate whether the carbohydrate moiety was required for efficient Ag uptake/processing or if it was directly involved in T cell recognition. In the latter case, it is likely that the glycol moiety is not involved in binding to the groove of MHC class II, but rather is recognized by the TCR. Carbohydrate recognition by the TCR has been suggested for the lipoglycans lipoarabinomannan (8) and glucose monomycolate (36), which are presented by CD1b to T cells and zwitterionic polysaccharides, which are presented in an MHC class II-restricted manner (37). Identification of the epitope will provide insight into the role of glycosylation in Ag presentation of LprG to T cells. Taken together, the biochemical and genetic evidence, the requirement for intracellular uptake, the MHC class II restriction, and the inability of the LprG Ag to activate several irrelevant T cell clones are suggestive of T cell specificity. Initially, using a T cell Western blot of a hydrophobic fraction of M. tuberculosis, we found that the T cell clone reacted to an ∼25-kDa product. Mass spectrometry of this 25-kDa product demonstrated the presence of two proteins, LprG (Rv1411c) and LprA (Rv1270c). Only one of these products had significant homology/identity to a gene product of M. leprae and that could account for the interspecies cross-reactivity. From this point it is commonly accepted that to fully demonstrate specificity of a T cell clone, that clone must react to a purified recombinant product or a defined peptide of the protein. Overlapping peptides spanning the entire sequence of LprG were synthesized, but they did not activate either of the LprG-reactive T cell clones. Therefore, the M. tuberculosis LprG was cloned into E. coli and M. smegmatis and the recombinant products were purified. Only the M. smegmatis-expressed product was reactive, leading to the hypothesis that glycosylation was involved in T cell reactivity. This hypothesis was tested using enzymatic deglycosylation of the recombinant product from M. smegmatis. Finally, the M. leprae LprG gene was cloned into M. smegmatis and the recombinant protein purified. In this case, the recombinant M. leprae protein also demonstrated reactivity to the T cell clone. Collectively, data from the biochemical, genetic, and immunological studies are most consistent with T cell activation by a single protein Ag, that is, LprG. However, further definition of the epitope with intracellular processing studies as well as MHC class II and TCR binding would be required to fully define the mechanism of T cell activation. There is substantial evidence that mycobacterial lipoproteins, including LprG, inhibit IFN-γ-induced MHC class II and subsequent Ag presentation by monocytic cells to T cells by a TLR2-dependent mechanism (15, 38, 39, 40, 41, 42). However, T cell responses to bacterial lipoproteins have been demonstrated in patients with infectious diseases; for example, 19-kDa-reactive T cells are detectable in patients with pulmonary tuberculosis (43) and Borrelia burgdorferi OspA-reactive T cells are detectable in patients with Lyme disease (44). Additionally, recombinant lipoproteins were able to elicit a protective immune response against M. tuberculosis in vivo (45). Finally, M. tuberculosis infection in mice did not reduce MHC class II expression as compared with TLR2−/− mice (46). In the present study, although LprG activated TLR2, the LprG-induced T cell responses were found to be TLR2 independent. The LprG-specific T cell clones were derived from leprosy patients, including one from a disease lesion. Therefore, although bacterial lipoproteins inhibit IFN-γ-induced MHC class II and subsequent Ag presentation to T cells in an in vitro system, the collective evidence suggests that lipoprotein-reactive T cells are generated in vivo during the course of infection. Several important experimental differences might explain the ability of LprG and other TLR2 ligands to inhibit IFN-γ-induced MHC class II Ag presentation on the one hand, yet result in generation of LprG-reactive MHC class II-restricted T cells in natural infection on the other hand. One possibility is that the in vitro model used IFN-γ-treated monocyte/macrophage APCs and the ability of lipoprotein to inhibit MHC class II expression and Ag presentation; in the present study, resting monocytes and dendritic cells presented LprG to T cell clones. Also, note that Harding and colleagues (15) examined the effect of prolonged (16 h) exposure of APCs to LprG on Ag presentation to T cells recognizing a different nonacylated protein Ag (e.g., tetanus toxoid). In contrast, in the present study we examined the ability of LprG to influence its own presentation to T cells and found that LprG does not interfere with its own T cell antigenicity. Although for a long time the T cell Ag repertoire was limited to conventional protein Ags, investigation of CD1-restricted T cell responses indicated a greater diversity of Ag structure including lipid, lipoglycans, and lipopeptides. The demonstration herein that a lipoglycoprotein serves as a traditional MHC class II-restricted T cell Ag, and that Ag presentation required the carbohydrate moiety, raises a concern regarding the approach for vaccination against mycobacteria as well as other pathogens in which lipoglycoproteins or glycoproteins are recognized by T cells. Such Ags may be pivotal for vaccines with the goal of triggering memory adaptive immune responses. However, these Ags are not glycosylated if recombinant Ag is produced in E. coli, nor would they be appropriately posttranslationally modified when encoded by DNA vaccines used in humans. Therefore, the nature of the Ag used for vaccine including its posttranslational modification would likely affect the efficacy of vaccines against microbial pathogens. In summary, the present data extend the universe of T cell Ags to include lipoglycoproteins, which simultaneously activate the TLR2-dependent innate immune responses and activate MHC class II-restricted adaptive T cell responses. We thank Dr. Delphine Lee for critical reading of the manuscript, Dr. Paul Godowski for the TLR2-neutralizing Ab, and the University of California tissue-typing laboratory for HLA typing of patients. ↵1 This work was supported in part by grants from the National Institutes of Health (AI22553 and AI47868 to R.L.M.) the Deutsche Forschungsgemeinschaft (FA849/1-1 to M.F. ), and material support through National Institutes of Health Contract NO1 AI75320 (to J.T.B.). ↵2 P.A.S., P.J.H., and K.M.D. contributed equally to this work. ↵3 J.T.B. and R.L.M. contributed equally to this work and share senior authorship. ↵5 Abbreviations used in this paper: CV, column volume; HIC, hydrophobic interaction chromatography; SE, size eclusion. Modlin, R. L., F. M. Hofman, D. A. Horwitz, L. A. Husmann, S. Gillis, C. R. Taylor, T. H. Rea. 1984. In situ identification of cells in human leprosy granulomas with monoclonal antibodies to interleukin 2 and its receptor. J. Immunol. 132: 3085-3090. Salgame, P., J. S. Abrams, C. Clayberger, H. Goldstein, J. Convit, R. L. Modlin, B. R. Bloom. 1991. Differing lymphokine profiles of functional subsets of human CD4 and CD8 T cell clones. Science 254: 279-282. Yamamura, M., K. Uyemura, R. J. Deans, K. Weinberg, T. H. Rea, B. R. Bloom, R. L. Modlin. 1991. Defining protective responses to pathogens: cytokine profiles in leprosy lesions. Science 254: 277-279. Modlin, R. L., J. Melancon-Kaplan, S. M. M. Young, C. Pirmez, H. Kino, J. Convit, T. H. Rea, B. R. Bloom. 1988. Learning from lesions: patterns of tissue inflammation in leprosy. Proc. Natl. Acad. Sci. USA 85: 1213-1217. Ridley, D. S., W. H. Jopling. 1966. Classification of leprosy according to immunity: a five-group system. Int. J. Lepr. 34: 255-273. Modlin, R. L., V. Mehra, L. Wong, Y. Fujimiya, W.-C. Chang, D. A. Horwitz, B. R. Bloom, T. H. Rea, P. K. Pattengale. 1986. Suppressor T lymphocytes from lepromatous leprosy skin lesions. J. Immunol. 137: 2831-2834. Mehra, V., B. R. Bloom, A. C. Bajardi, C. L. Grisso, P. A. Sieling, D. Alland, J. Convit, X. D. Fan, S. W. Hunter, P. J. Brennan, et al 1992. 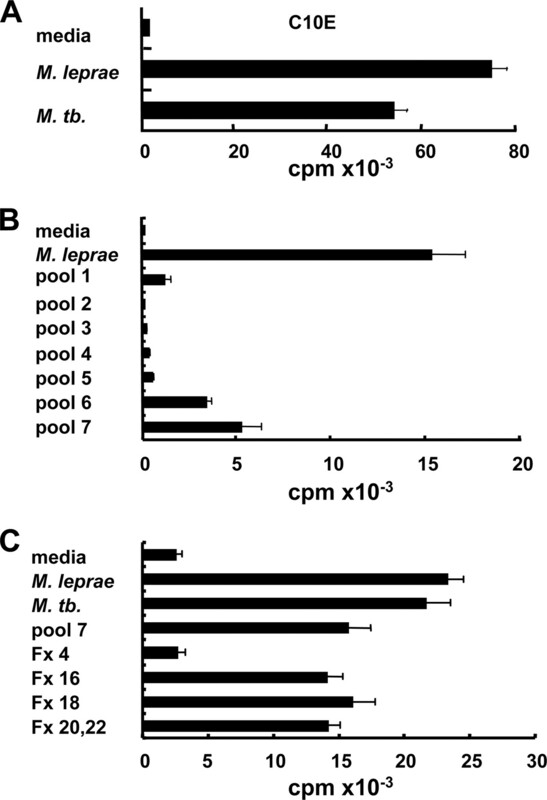 A major T cell antigen of Mycobacterium leprae is a 10-kD heat-shock cognate protein. J. Exp. Med. 175: 275-284. Sieling, P. A., D. Chatterjee, S. A. Porcelli, T. I. Prigozy, T. Soriano, M. B. Brenner, M. Kronenberg, P. J. Brennan, R. L. Modlin. 1995. CD1-restricted T cell recognition of microbial lipoglycans. Science 269: 227-230. Porcelli, S., C. T. Morita, M. B. Brenner. 1992. CD1b restricts the response of human CD4−8−T lymphocytes to a microbial antigen. Nature 360: 593-597. Rojas, R. E., M. Torres, J. J. Fournie, C. V. Harding, W. H. Boom. 2002. Phosphoantigen presentation by macrophages to Mycobacterium tuberculosis: reactive Vγ9Vδ2+ T cells: modulation by chloroquine. Infect. Immun. 70: 4019-4027. Sabet, S., M. T. Ochoa, P. A. Sieling, T. H. Rea, R. L. Modlin. 2007. Functional characterization of a T-cell receptor BV6+ T-cell clone derived from a leprosy lesion. Immunology 120: 354-361. Beckman, E. M., A. Melian, S. M. Behar, P. A. Sieling, D. Chatterjee, S. T. Furlong, R. Matsumoto, J. P. Rosat, R. L. Modlin, S. A. Porcelli. 1996. CD1c restricts responses of mycobacteria-specific T cells: evidence for antigen presentation by a second member of the human CD1 family. J. Immunol. 157: 2795-2803. Hirschfield, G. R., M. McNeil, P. J. Brennan. 1990. Peptidoglycan-associated polypeptides of Mycobacterium tuberculosis. J. Bacteriol. 172: 1005-1013. Turner, J., K. M. Dobos, M. A. Keen, A. A. Frank, S. Ehlers, I. M. Orme, J. T. Belisle, A. M. Cooper. 2004. A limited antigen-specific cellular response is sufficient for the early control of Mycobacterium tuberculosis in the lung but is insufficient for long-term survival. Infect. Immun. 72: 3759-3768. Gehring, A. J., K. M. Dobos, J. T. Belisle, C. V. Harding, W. H. Boom. 2004. Mycobacterium tuberculosis LprG (Rv1411c): a novel TLR-2 ligand that inhibits human macrophage class II MHC antigen processing. J. Immunol. 173: 2660-2668. Belisle, J. T., M. G. Sonnenberg. 1998. Isolation of genomic DNA from mycobacteria. Methods Mol. Biol. 101: 31-44. Mustafa, A. S., F. A. Shaban, R. Al Attiyah, A. T. Abal, A. M. El Shamy, P. Andersen, F. Oftung. 2003. Human Th1 cell lines recognize the Mycobacterium tuberculosis ESAT-6 antigen and its peptides in association with frequently expressed HLA class II molecules. Scand. J. Immunol. 57: 125-134. Gerlach, J. T., A. Ulsenheimer, N. H. Gruner, M. C. Jung, W. Schraut, C. A. Schirren, M. Heeg, S. Scholz, K. Witter, R. Zahn, et al 2005. Minimal T-cell-stimulatory sequences and spectrum of HLA restriction of immunodominant CD4+ T-cell epitopes within hepatitis C virus NS3 and NS4 proteins. J. Virol. 79: 12425-12433. Krutzik, S. R., M. T. Ochoa, P. A. Sieling, S. Uematsu, Y. W. Ng, A. Legaspi, P. T. Liu, S. T. Cole, P. J. Godowski, Y. Maeda, et al 2003. Activation and regulation of Toll-like receptors 2 and 1 in human leprosy. Nat. Med. 9: 525-532. Johnson, C. M., E. A. Lyle, K. O. Omueti, V. A. Stepensky, O. Yegin, E. Alpsoy, L. Hamann, R. R. Schumann, R. I. Tapping. 2007. Cutting edge: A common polymorphism impairs cell surface trafficking and functional responses of TLR1 but protects against leprosy. J. Immunol. 178: 7520-7524. Cole, S. T., R. Brosch, J. Parkhill, T. Garnier, C. Churcher, D. Harris, S. V. Gordon, K. Eiglmeier, S. Gas, C. E. Barry, III, et al 1998. Deciphering the biology of Mycobacterium tuberculosis from the complete genome sequence. Nature 393: 537-544. Rikiishi, H., S. Okamoto, S. Sugawara, K. Tamura, Z. X. Liu, K. Kumagai. 1997. Superantigenicity of helper T-cell mitogen (SPM-2) isolated from culture supernatants of Streptococcus pyogenes. Immunology 91: 406-413. Haslett, P. A., L. G. Corral, M. Albert, G. Kaplan. 1998. Thalidomide costimulates primary human T lymphocytes, preferentially inducing proliferation, cytokine production, and cytotoxic responses in the CD8+ subset. J. Exp. Med. 187: 1885-1892. Sieling, P. A., W. Chung, B. T. Duong, P. J. Godowski, R. L. Modlin. 2003. Toll-like receptor 2 ligands as adjuvants for Th1 responses. J. Immunol. 170: 194-200. Herrmann, J. L., R. Delahay, A. Gallagher, B. Robertson, D. Young. 2000. Analysis of post-translational modification of mycobacterial proteins using a cassette expression system. FEBS Lett. 473: 358-362. Muhlradt, P. F., M. Kiess, H. Meyer, R. Sussmuth, G. Jung. 1997. Isolation, structure elucidation, and synthesis of a macrophage stimulatory lipopeptide from Mycoplasma fermentans acting at picomolar concentration. J. Exp. Med. 185: 1951-1958. Hayashi, S., H. C. Wu. 1990. Lipoproteins in bacteria. J. Bioenerg. Biomembr. 22: 451-471. Belisle, J. T., M. Braunstein, I. Rosenkrands, P. Andersen. 2005. The proteome of Mycobacterium tuberculosis. S. T. Cole, III, and K. D. Eisenach, III, and D. N. McMurray, III, and W. R. Jacobs, Jr, eds. Tuberculosis: Pathogenesis, Protection, and Control 235-260. ASM Press, Washington, D.C..
VanderVen, B. C., J. D. Harder, D. C. Crick, J. T. Belisle. 2005. Export-mediated assembly of mycobacterial glycoproteins parallels eukaryotic pathways. Science 309: 941-943. Backlund, J., S. Carlsen, T. Hoger, B. Holm, L. Fugger, J. Kihlberg, H. Burkhardt, R. Holmdahl. 2002. Predominant selection of T cells specific for the glycosylated collagen type II epitope (263–270) in humanized transgenic mice and in rheumatoid arthritis. Proc. Natl. Acad. Sci. USA 99: 9960-9965. Ishioka, G. Y., A. G. Lamont, D. Thomson, N. Bulbow, F. C. Gaeta, A. Sette, H. M. Grey. 1992. MHC interaction and T cell recognition of carbohydrates and glycopeptides. J. Immunol. 148: 2446-2451. Vlad, A. M., S. Muller, M. Cudic, H. Paulsen, L. Otvos, Jr, F. G. Hanisch, O. J. Finn. 2002. Complex carbohydrates are not removed during processing of glycoproteins by dendritic cells: processing of tumor antigen MUC1 glycopeptides for presentation to major histocompatibility complex class II-restricted T cells. J. Exp. Med. 196: 1435-1446. Prigozy, T. I., P. A. Sieling, D. Clemens, P. L. Stewart, S. M. Behar, S. A. Porcelli, M. B. Brenner, R. L. Modlin, M. Kronenberg. 1997. The mannose receptor delivers lipoglycan antigens to endosomes for presentation to T cells by CD1b molecules. Immunity 6: 187-197. Hunger, R. E., P. A. Sieling, M. T. Ochoa, M. Sugaya, A. E. Burdick, T. H. Rea, P. J. Brennan, J. T. Belisle, A. Blauvelt, S. A. Porcelli, R. L. Modlin. 2004. Langerhans cells utilize CD1a and langerin to efficiently present nonpeptide antigens to T cells. J. Clin. Invest. 113: 701-708. Cobb, B. A., Q. Wang, A. O. Tzianabos, D. L. Kasper. 2004. Polysaccharide processing and presentation by the MHCII pathway. Cell 117: 677-687. Fortune, S. M., A. Solache, A. Jaeger, P. J. Hill, J. T. Belisle, B. R. Bloom, E. J. Rubin, J. D. Ernst. 2004. Mycobacterium tuberculosis inhibits macrophage responses to IFN-γ through myeloid differentiation factor 88-dependent and -independent mechanisms. J. Immunol. 172: 6272-6280. Gehring, A. J., R. E. Rojas, D. H. Canaday, D. L. Lakey, C. V. Harding, W. H. Boom. 2003. The Mycobacterium tuberculosis 19-kilodalton lipoprotein inhibits γ interferon-regulated HLA-DR and FcγR1 on human macrophages through Toll-like receptor 2. Infect. Immun. 71: 4487-4497. Pai, R. K., M. Convery, T. A. Hamilton, W. H. Boom, C. V. Harding. 2003. Inhibition of IFN-γ-induced class II transactivator expression by a 19-kDa lipoprotein from Mycobacterium tuberculosis: a potential mechanism for immune evasion. J. Immunol. 171: 175-184. Fulton, S. A., S. M. Reba, R. K. Pai, M. Pennini, M. Torres, C. V. Harding, W. H. Boom. 2004. Inhibition of major histocompatibility complex II expression and antigen processing in murine alveolar macrophages by Mycobacterium bovis BCG and the 19-kilodalton mycobacterial lipoprotein. Infect. Immun. 72: 2101-2110. Hohn, H., C. Kortsik, K. Nilges, A. Necker, K. Freitag, G. Tully, C. Neukirch, M. J. Maeurer. 2001. Human leucocyte antigen-A2 restricted and Mycobacterium tuberculosis 19-kDa antigen-specific CD8+ T-cell responses are oligoclonal and exhibit a T-cell cytotoxic type 2 response cytokine-secretion pattern. Immunology 104: 278-288. Meyer, A. L., C. Trollmo, F. Crawford, P. Marrack, A. C. Steere, B. T. Huber, J. Kappler, D. A. Hafler. 2000. Direct enumeration of Borrelia-reactive CD4 T cells ex vivo by using MHC class II tetramers. Proc. Natl. Acad. Sci. USA 97: 11433-11438. Wang, B., M. Henao-Tamayo, M. Harton, D. Ordway, C. Shanley, R. J. Basaraba, I. M. Orme. 2007. A Toll-like receptor-2-directed fusion protein vaccine against tuberculosis. Clin. Vaccine Immunol. 14: 902-906. Banaiee, N., E. Z. Kincaid, U. Buchwald, W. R. Jacobs, Jr, J. D. Ernst. 2006. 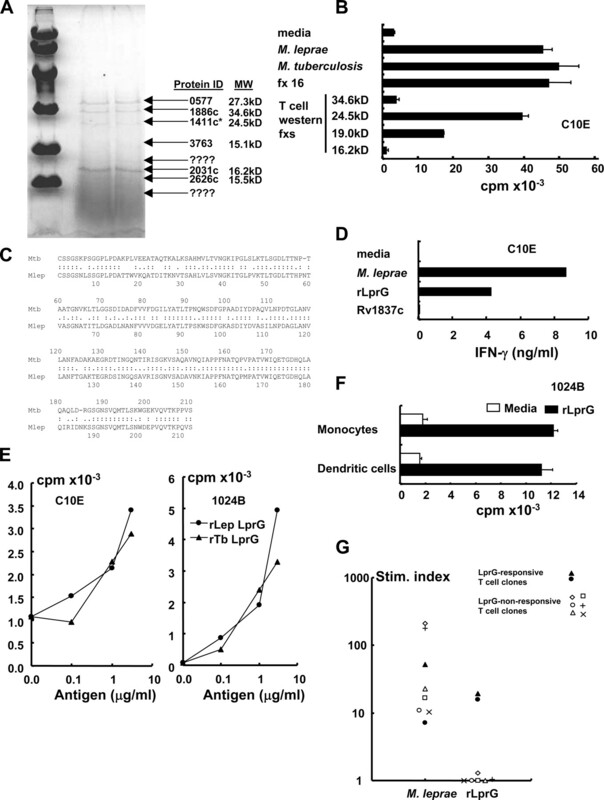 Potent inhibition of macrophage responses to IFN-γ by live virulent Mycobacterium tuberculosis is independent of mature mycobacterial lipoproteins but dependent on TLR2. J. Immunol. 176: 3019-3027. Niazi, K. R., M. T. Ochoa, P. A. Sieling, N. E. Rooke, A. K. Peter, P. Mollahan, M. Dickey, S. Rabizadeh, T. H. Rea, R. L. Modlin. 2007. Activation of human CD4+ T cells by targeting MHC class II epitopes to endosomal compartments using human CD1 tail sequences. Immunology 122: 522-531.